Special seasonal interest on the altar helps to unite the time of year with the many church celebrations of the Episcopal church year. Advent, Christmas, Epiphany, Easter, the Feasts, as well as winter, summer, fall and spring are all important to consider when designing the altar flowers. At this time of year, we focus on floral design for Advent through Christmas. In the winter, especially during the weeks of Advent, we see lots of red berries, variegated and green hollies, winterberry, evergreen boughs, ivies, white and gray birch twigs and sticks, white lilies, hydrangeas, white calla lilies, red and/or white roses, white and/or pink amaryllis. When choosing flowers, consider the colors you’d like to display. For those who enjoy the traditional colors of the season, nothing is more festive than a red, green and white palette during Advent through Christmas Eve. 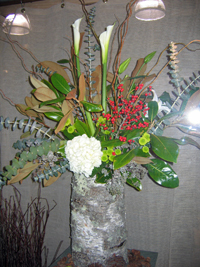 On Christmas day think about changing the colors to all white flowers with evergreen boughs and birch stems. You could even put a bit of silver gray into the mix. For those Episcopal churches that use light or darker blue as the color of the Advent season, choose a color palette of white, off-white, pale beige and light blue. Obviously use no red, gold or bright yellow. You could use white lilies, white French tulips and white spider mums sprayed with a light blue dusting to pick up the color of the altar paraments. Then you might use traditional variegated greens, white birch stems and some very pale yellows as a subtle accent to pick up the brass altar vases and vessels. This combination of colors is very effective and integrates the colors used throughout the church—from the altar to the baptismal font. Consider, too, the maintenance of your floral arrangements as you may need to refresh the flowers throughout the week for special seasonal services. One way to keep flowers fresh is to put a jigger of inexpensive vodka in the vase water. Not only does this help to keep the water clean, but it also helps the stems stay open to drink and absorb the water. If you use white or red poinsettias in your vases, take a candle flame (or lighter) and sear the end of the cut stem. This stops the poinsettia from wilting and prevents the stem sap from interfering with other flowers in the arrangement. If you like to include Christmas trees in your design, you might think about decorating them with white or blue lights. However, the aesthetics can be quite effective when they are left unadorned; that is, no ornamentation with the exception of tall white birch stems bundled and placed at the top of the tree to create a starburst effect. This is a very beautiful way to reflect a natural feeling but with a bit of baroque majesty suiting the season. Three fir trees of different sizes grouped together either at the back of the church around the font and/or on the side of the main altar (if there is room) is another elegant possibility. Surround the base of the tree (or trees) with white poinsettias. This simple arrangement lasts all season and allows the evergreen freshness to filter throughout the church. Don’t forget about window arrangements. Use the same flowers, color palette and materials to integrate themes. Make sure that all your arrangements and trees are kept well watered. Use the vodka for the horticultural reasons (well, maybe a shot for you, too?). Now step back and enjoy the season. Merry Christmas!